Citrine is one of the most popular gemstones in the quartz group. 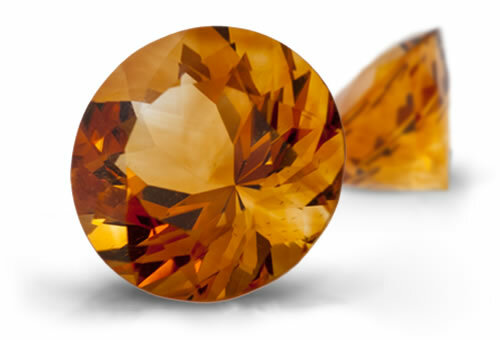 Prized for its excellent transparency, citrine is one of November's birthstones. Naturally, it occurs in close proximity to amethyst and is found in beautiful golden, mandarin orange and madeira red hues. It's possible that quartz crystals that grew naturally as amethyst or smoky quartz were turned into citrine by natural heat from nearby magma activity. Today, many of the citrines on the market are actually heated amethyst or smoky quartz. refractive index, birefringence, optic character and optic figure. A bull's-eye optic figure is determinative for quartz. Might also show Airy's spiral. Careful observation that reveals Brazil-law twinning separates citrine from scapolite with similar properties. Citrine is the common variety name for transparent quartz with a predominantly yellow to orange body color. Stones might be piezoelectric: able to generate electricity produced by mechanical pressure, Pyroelectricity: development of opposite charges at the ends of the axis due to change in temperature and triboluminescent: luminescence produced by friction. Misnomers: topaz quartz, Spanish topaz, Saxon topaz, Madeira topaz, citrine topaz, topaz quartz. Citrine is a type I clarity. Color zoning in citrine is often present in the form of "tiger stripes" or "zebra stripes". Stones may contain crystals, negative crystals, liquid inclusions, two-phase inclusions and partially-healed fractures.